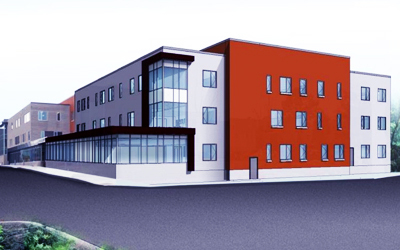 Description: Located in Hyde Park, MA, the new campus of the Boston Preparatory Charter School will include a 48,800 gsf building as well as various site improvements such as 56-vehicle parking, landscaping, and play courts. BPCPS is a public charter school, accepting Boston students via a public lottery and serving grades six through 12. The 35 foot-high structure will span three stories. Scope of Work: As the special inspection and testing firm on this project, Fenagh Engineering and Testing conducted extensive soils analysis, concrete sampling and testing, masonry inspection and testing, and structural steel inspection.